I'm posting this in "light editing" mode because these are information observations and comments and I want to be timely. I've been spending a lot of time working on the more complex issue essays and don't want to delay this. I just came back from http://www.ao2003.com -- the Always-On conference. Thanks to Ross Mayfield of Socialtext bloggers are being treated as press and I guess I'm a blogger though I see myself more as an essayist. Turns out I was back home but as I started to write this I tuned into the web site and found I could still participate from afar. I judge events by the attendees more than by the panelists and, by that measure, the event has gotten off to a good start. The concept of being always-on or always connected is a good one though, in my opinion, it is important to distinguish between the transport issues that enable connectivity and the question of what one does with connectivity and the implications. This confusion is reflected in some of the panels. As I write this I'm still attending remotely. 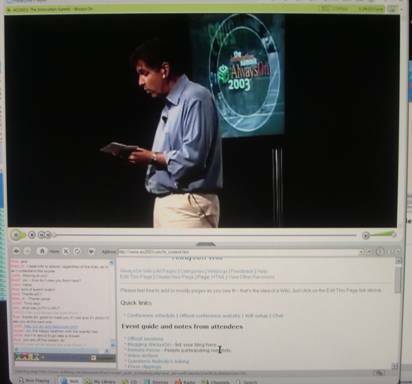 I can view the conference over the Internet with very good audio and video quality. Socialtext is provided a live commenting facility using their Wiki software. This is wonderful for those like me who want to jump up and say "that's stupid" or maybe even be positive. There were problems with 802.11 connectivity the first day so I had only a few opportunities for such commentary though I did make good use of it. Today, from home, it appears to be working better and I've been able to add my own comments on the side. Participating from afar is interesting. The audio/video works very well but I miss the ability to kibitz with others. A side-chat facility would help. Still, this is my first time trying such remote participation. Having been there for the first day I have some sense of the context and it works very well. Of course this is early stage and I can think of a lot of improvements but it is mundanely useful rather than being a novelty. AOL. Jonathan Miller, Chairman and CEO gave the keynote. The features of the AOL 9.0 interface were cute and even innovative but far more interesting was his explanation of how they were acting as a broker or aggregate of access to paid services. As we get IP connectivity I've been arguing that we will need the ability to buy the kind of services and content we are used to getting from the CableCos. The problem is that AOL hasn't identified this service as a value in its own right but only as part of the AOL package and that's their fundamental problem. They need to shift from being the newbie's Internet to being a provider of services to Internet users. The Internet is about far more than the Web or even the PC. AOL can't continue to try to be between the users and the Internet but they have a lot to offer to users who want services and content. In fact, the synergy argument that drove the merger with Time-Warner does make sense. AOL's experience in offering services of the Internet can help Time-Warner wean itself from dependency upon own its own transport. At this point, I don't expect much. AOL Broadband is having trouble explaining to people who now want DSL or Cable modem access what role they play in the post-dial up world. Time-Warner will find that owning the pipe become problematic as IP packets refuse to stay within their own pipes. But in the short term the income from owning the cable plant and AOL's image as "the Internet" for newbies will make it hard for them to prepare themselves when the cable can't be owned and when newbies become Internet participants. Wireless Panel. I've already written about the problem with the carrier-based model in my essay on Hot Spots and Cold Cells. I tried to make this point but Roderick Nelson accused me of wanting everything to be free and that I was anti-capitalist. This is a wonderful example of how self-delusion works. I'm not asking for anything to be free. I'm arguing that the current business model doesn't work and we need to find a new one. I already wrote about this issue in the Hot/Cold essay so no need to repeat it here though I did have to explain it to a new audience -- or try to. Hollywood versus Silicon Valley. I'm not mentioning panels I skipped or only dropped in on. This was one of those but I do want to respond to one point. One panelist was a token kid (15 years old) who said he didn't have the idea you would pay for music. This was called a moral defect. But at some point you need to deal with reality. If you're in New York you might lament crime but you still lock your door. The music industry has to come to terms with reality instead of assuming they can criminalize all behavior that shows their marketplace model is broken. There are other models like being sponsored as Mozart was. This isn't necessarily the right answer and isn't the only answer. But demonizing kids is a dead end and is a proxy for demonizing the technology. There is a willful arrogance on the part of the record industry. They act as if they are the creative ones when their real goal is to assure that there cannot be any creativity other than that which they manage and control to the point of rendering it sterile. They are making a travesty of the United States Constitution by denying others the opportunity to be creative. Far more damaging, they are containing their creativity in such a way that there is little new creativity that comes from it. The technology they seek to contain yields much direct benefit but far more benefit as others build on it. In the center is the OSGi Gateway. This is supposed to be installed by the carriers. Other providers would lease out "space" on it. Today's version is simply an IP connection point -- the $30 router. The slide says "Broadband modem; Ethernet Hub; Wireless Access Point". This is close but it's just commodity connectivity. WAP phone. This is the strange notion that the device defined by the CellCo is the way we control everything. Of course it goes over the cell networking and then is connected by IBM (a sponsor) to the Internet. Why not just use the Internet? IBM is also in the middle between the Internet and an appliance manufacturer. IBM seems to be there for no reason other than collecting money for something. Whirlpool Web Tablet on a refrigerator. Can't get hokier so I won't bother saying anything. HP Printer connected to the gateway. Misses the point of course. It is supposed to be connected to the Internet segment within the house. OK, maybe the diagram uses the arrow to mean network but since everything else is labeled this is a glaring omission and is a strong indicator that it's all about placement opportunity within the home and not giving the consumer the ability to solve problems. Icebox Flip screen. Another branding opportunity. Power line converter thence to the Whirlpool Polara Range with an NIC (Network Interface Card) featured. Like nothing else has a NIC? Sears (Deployment and Customer Support is listed at the bottom). Sears seems to make the most sense here by not making claims. In fact William Kenney of Sears was open about the challenge of the net and is open to ideas. James Devlin of Invensys also spoke about simple mundane utility. The good news is that most panelists seemed to be open to the simple idea of taking advantage of connectivity. But the IHA seems to be a throwback to corporate placement opportunities whose purpose is to convince investors and analysts that they are part of the future. Homeward Bound. I updated the first paragraph to note that though I flew home, I was still a t the conference in a sense. While it's not the same as being their in person, I was surprised how well the combination of the video and Wiki worked. Over my standard home Internet connection I had very good audio and video quality in looking at the panel. I don't know how to capture the screen picture that included the video so I simply used my digital camera to take a picture. That's Tony Perkins summing up the conference discussion log is in the lower left. There was a lively discussion with people in the room and others outside such as Joi Itcho in Japan and me at home. Joi mentioned that he was attending in his underwear and people wanted to get a video of him. He obliged though only above the waist. 3COM/Palm's Eric Benhamou gave the Thursday keynote. One nice thing about the conference are the giveaways and deals. 3Com had provided Palm Tungsten C's at half price -- $250 instead of $500 with the option of returning it before the end of the conference. I couldn't resist. The Tungsten C has built in 802.11. Putting aside the conference' technical problems it is a very nice device and the 802.11 works smoothly (as long as you don't use the "Web Pro" WAP browser). It comes loaded with interesting apps -- though some are trial versions. Eric directed his talk mainly at investors and tried to explain why things were going to be getting better. He spoke about how they did carefully directed innovation -- a concept I find antithetical to real innovation as I pointed out in the Wiki. Out of the box the Palm is slicker than the Pocket PC machine. A number of the ideas are basically better. For example, both can let me synchronize over 802.11 but only the Palm makes it easy for me to change the host name and I can do the very first synchronization over the network (for some reason my USB synch didn't work). My bet is still on the platform with better development tools. The original Macintosh was much slicker Microsoft's PC which was still mired in character interface. While one can argue about the reasons for Microsoft's triumph a key factor was the development community that added value beyond the slickness of the Mac which was defined as a unified experience. Unified only as long as you used it as intended by Apple (or, to make it personal) Steve Jobs. A constant theme I've been pushing and belabored during this conference is that the user should define the device and experience. The villain is the cellular phone (again, Faux Wires). People keep asking for the cell companies to please give them application and capabilities. During the last panel one of the people in the audience asked when we were going to get the universal communicator and assumed that it will be based on the cell phone. But the audience was full of people with their Tungsten C's (as well as other PDAs) that were already acting as communicators--connected to the Web via the 802.11 connection. With available software it could act as a telephone over the same connection. The word "universal" is part of the ""one device that does everything" fantasy. Perhaps that's why a real device that is useful doesn't count. It seems that people would rather wait for "them" (whoever them is) than take advantage of the opportunities they already have. While I might prefer that the Palms be more developer friendly, they are very different than the cellular phones which are developer-hostile. Developer-hostile is really user-hostile because it denies users a marketplace for capabilities. I plan to write more about what I'm calling fractional PC's. This is based on the idea of the fractional horsepower or tiny motors that now proliferate rather than the days when a factory would share a single motor. I call it a PC since I want to emphasize it as an open development platform rather than embedded system but I am using the term "personal computer" in a generic sense to include Linux and other platforms. Web Services. This session suffered because the term "Web Services" was never defined. Raymond Lane of Kleiner Perkins did a good job of laying out some issues and complexities. Us Wiki-ers had our running commentary but it was otherwise a null panel. Journalists' Outlook. I looked forward to this because I know some of the panelists and like them. But this too wandered abound the old question of what does all this Internet stuff mean for the Web. Dan Gillmor was featured since he runs his own column as a web blog so is, by comparison, an expert on this. The Wiki was active with side discussions but the lack of framing made it a rambling discussion -- or more with the Wiki wandering on its own.